The Count Almaviva is smitten with Rosina, the beautiful ward of old Dr. Bartolo, who intends to marry her. Figaro, barber extraordinaire, offers to help Almaviva win her heart. The Count tells Rosina that he is “Lindoro,” a humble student. 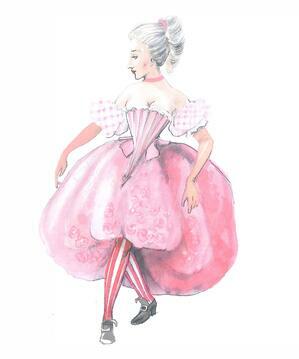 Figaro suggests that Almaviva disguise himself as a soldier in order to gain access to Dr. Bartolo’s house. The enamored Rosina writes a letter to “Lindoro” and vows to be with the man she loves. Basilio, her music teacher, warns Dr. Bartolo about the Count, and Bartolo decides to speed up his own marriage to Rosina. Almaviva arrives disguised as a drunken soldier but is refused entry—although he manages to slip Rosina a love note. Almaviva narrowly avoids arrest in the resulting confusion. Later that day, Almaviva disguises himself as “Don Alonso,” a substitute music teacher, and the lovers plot their elopement during Rosina’s singing lesson. Figaro distracts Bartolo with a shave, but finally Bartolo get suspicious and throws everyone out. Now, Bartolo is determined to marry Rosina that very night. He convinces Rosina that Lindoro is plotting with the Count to seduce her. Heartbroken, she agrees to marry Bartolo. That night, Figaro and Almaviva steal into Rosina’s room. She accuses them of betrayal, but finally Almaviva reveals his true identity. Bartolo and a group of soldiers aren’t far behind—can Figaro’s quick wits win the day for love? including Norma (with its famous soprano aria, “Casta diva”), La Fille du Régiment (Pavarotti nailed the tenor aria’s series of high C’s to wild acclaim), and Lucia di Lammermoor (with its tour de force mad scene for a murderous soprano). a food connoisseur and excellent amateur chef. 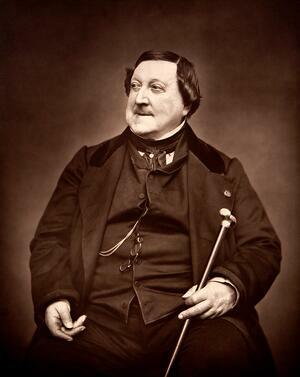 There are dozens of recipes “alla Rossini”—probably the most famous is Tournedos Rossini (filet mignon served on toasted bread and topped with foie gras and truffles). In the mood for a beverage before the opera? Images (top to bottom): Matthew Worth, Daniela Mack, and Jesus Garcia; A costume rendering for the character of Rosina by designer Gianluca Falaschi; Rossini, photographed in 1865 by Étienne Carjat.